If you had to pick one overriding theme of CES 2014, you couldn’t be blamed for saying 4K. After all, displays of all sizes were featured during the show this week with 4K or Ultra HD resolution, from 4K monitors, to 4K bendable TVs — even 4K mobile devices. Indeed, Panasonic has unveiled a new tablet called the Toughpad 4K UT-MA6, which sports a 20-inch screen with a resolution of 3840 x 2560. 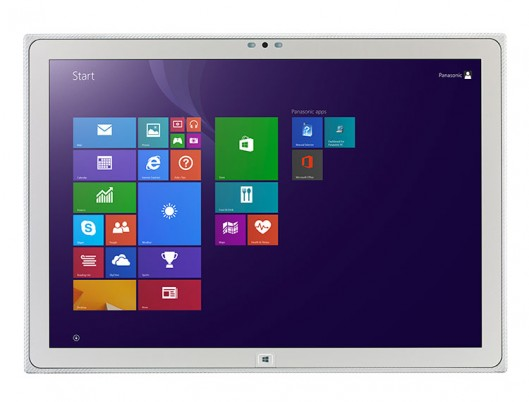 Obviously, a 20-inch tablet is something of a niche offering and Panasonic knows this, based on the fact that the UT-MA6 runs Windows — photos of the device show it running both Windows 7 and 8 — and starts at $6,000. In other words, this is clearly a tablet aimed squarely at creative professionals who will get the most out of the screen real estate. Aside from its size, resolution and the cost of a Windows license, the UT-MA6 justifies its price point through sheer build quality. The tablet boasts a magnesium alloy case with a glass fiber bezel and back that not only looks nice, but also offers some durability. In particular, the UT-MA6 is apparently able to withstand drops from up to 2.5 feet. And yet, it only weighs 5.6 lbs — by comparison, Microsoft’s work-oriented Surface Pro 2 weighs in at 2.0 lbs with a 10.6-inch display — while measuring a mere half-inch thick. Of course, the really impressive aspect of the UT-MA6 is its display, which is an IPS panel, ensuring top-quality color accuracy compared to cheaper TN panels, that supports 10-finger touch and optical stylus input. To drive this display, the tablet features an Intel Core i7-3687 processor with vPro clocked at 2.1 GHz, 16GB of RAM and Nvidia Quadro K1000M graphics. Add to this a 256GB SSD, USB 3.0 and a DisplayPort, and you’ve got yourself one impressive niche offering.